Coaching is a great way to reach your full potential both personally and professionally. Sumeet Chandra shares a how-to guide on picking the right candidate to coach and going about the coaching process. Here is an excerpt from his session on the topic. Anyone who has been a part of any transformation journey, whether a professional or a personal one, will agree that success or sustenance of any transformation lies in the changed attitude which we have towards the transformation. One of the most powerful tools known and used across the world for changing one’s mindset is coaching. Coaching delivers a large ROI and benefits the employee and the organization. A Manchester study attempted to quantify the benefits received by a sample of 100 senior business executives, they found that Leadership Coaching delivered an ROI of 5.7 times the investment. There are two aspects to coaching – Who needs to be coached and how the candidate needs to be coached. Is coaching meant for all? – yes and no. Everyone needs a coach at some point in their career if they really want to reach their full potential. This when coaching is meant for all. The matrix shown above is pretty easy to use. Map the potential candidates on the above grid based on their skill set and enthusiasm . 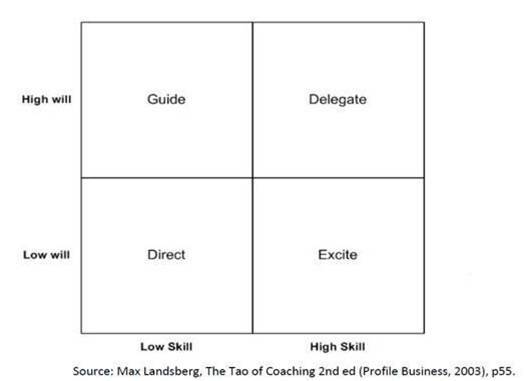 Once this is done it is pretty easy to infer that people in the third quadrant (Low Will/High Skill) will be the best to coach as the ROI is the highest in this case. Coaching is all about asking the right questions. 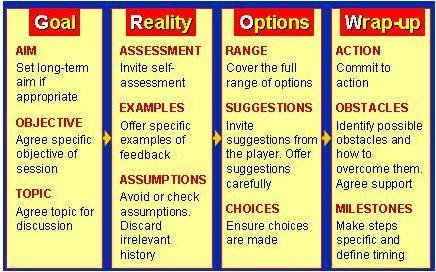 A well known coaching model ‘GROW’, enables the coach to structure a coaching conversation and deliver a meaningful result. A word of caution – one size doesn’t fit all, coaching is customized as per the coachee’s requirements or needs. What works for one individual may be unsuitable for another because the mix of confidence and competence varies. Perhaps the most important skill for the coach is the ability to flex, reflect and adapt to the needs of the coachee. In fact the key to success in the coaching process is mutual trust and honesty. Without it, the coachee will not risk going outside their comfort zone. Summary: Coaching is about helping others grow in the right direction. 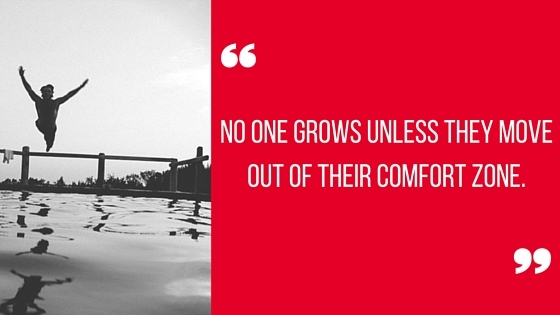 As one coach said, “No one grows unless they move out of their comfort zone”. As coaches we expect our coachee’s to move out of their comfort zone. In parallel we must ensure we are confident of moving outside our own comfort zone to ensure that the service we provide to our clients is truly exceptional. That is the best ROI that any coach can deliver. Have you undergone coaching? How did it help transform your career and personal growth? Share your views with us in the comments below.